P.S. Ooooh… NEXT year will be our 13th Anniversary… we should up the bar and change the format. Better start brainstorming now. Open to ideas! NOW: See Braddock Steele in Soluna City to travel to the Rainbow Road & fight Lucky Warriors and Leprescythes while collecting Clovers to open the reward shops. Apologies for the issue causing a black screen while you were collecting Clovers - that issue is now FIXED. WEDNESDAY: A brand-new mission launches! As for new equipment? We've got Lucky Mechas on their way to you, including Elite House Mecha models for the high-level players! The Advanced versions will scale to higher levels, too. There's also a surprise model on its way, thanks to Ash! Happy Birthday to Gibby! The Giblet Skewer is coming back to the Birthday Shop in Soluna City to commemorate the happy occasion. 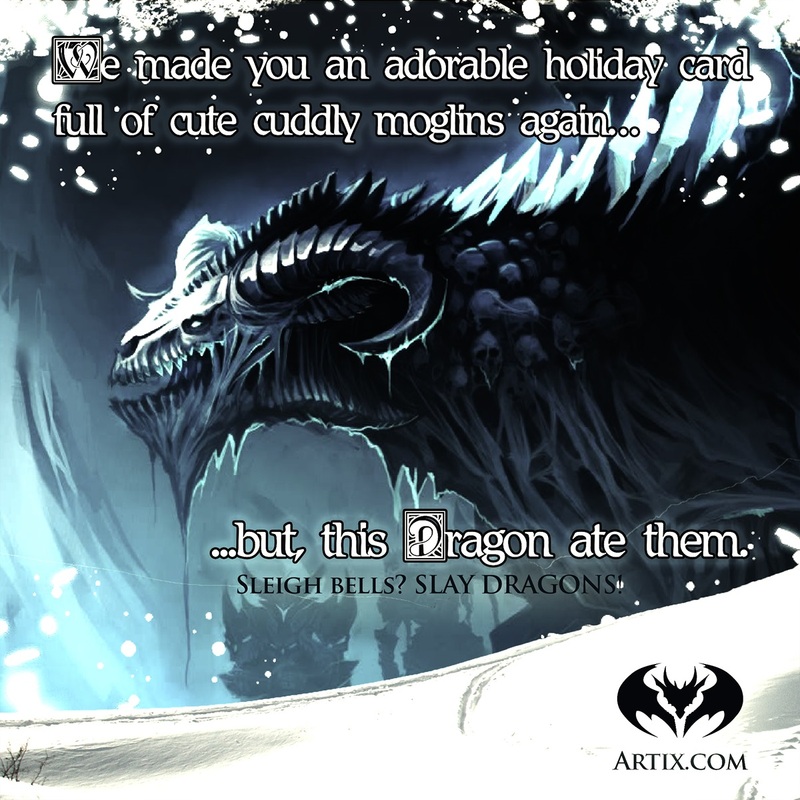 And now a very important announcement from Artix! 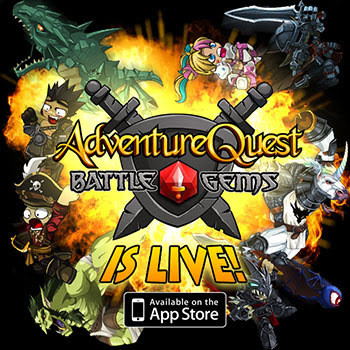 Do not forget to LIKE the BattleGems Facebook page! 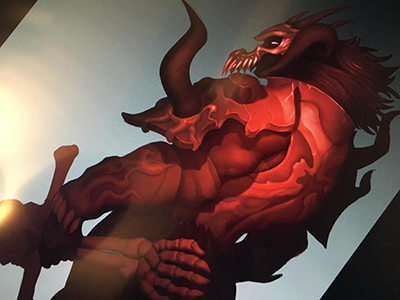 Thanks, Artix! I'm eager for the Android release, myself! Stay tuned for more MechQuest news, and thanks for playing! Make sure you don't miss this year's Zorbo pet! You can also replay past holiday event, & get your Star Captain wrapped gifts! P.S. Thank you to everyone who upgraded to StarCaptain or bought NovaGems to support our weekly releases. We are very grateful that you give us the opportunity to keep making all our games better each week. For the past year we have watched as more and more of our players moved away from playing video games on web and are now playing on their iPhones, Androids, iPads and other mobile devices. This has created a challenge for us because Flash does not run on most phones. As you know, we created our games including MechQuest, DragonFable, EpicDuel, AdventureQuest Worlds & AQClassic using Adobe Flash. Futhermore, Adobe seems to have 'thrown in the towel' for Flash & Air on mobile. As a result, we have started Project: Omni. It is not a game. Omni means "all." It is the code name for our new method of creating creating games. It will allow us to create games that run on the web, iphones, androids, windows, tablets, toasters, etc. We call them... omni-games. Can MechQuest become an omni-game? It most certainly can! I saw this with a lot of enthusiasm but everyone needs to understand. Everything needs to be re-created from scratch to do it. Some of the things that were really easy to do in the Flash version of MechQuest are border-line impossible to do in an omni-game. However, somethings that were border-line impossible to do in Flash... are now possible! (It is a super weird but liberating trade off.) So... if we have to recreate everything and make a "NEW MECHQUEST" to go mobile anyway, we might as well brain storm with the sky being the limit. 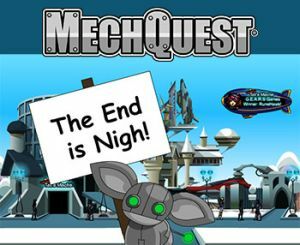 While the current Flash version of MechQuest will live on forever, updated by Maegwyn and her team, the NEXT version of MechQuest could be a huge step forward for us. If the sky is the limit... what should MechQuest 2 be? What would you actually love playing in the next version of MechQuest? A 3D mecha simulator? Dragons vs Mecha? A tactical stategy game? An expansive universe where you can pilot ships, drop mecha on planets, and then battle for the planets? A pvp game? Old school anime or crazy new 3D style? I feel that we should have a lot of conversation about what to build next. You are the best person to have it with. The people who are reading this are the serious fans of MechQuest. The people who want to see it live on into the next century. (You probably want to play it on your phone and then be able to log onto your computer and continue where you left off with better graphics.) So please kick off the conversations about what we should build next. And if someone says something REALLY GOOD... please... for the love of all that is explody and awesome.... send me a link on Twitter, Facebook, Email, or via a smoke signal! Most of the young and eager mecha pilots of Gears University laugh and dismiss his doom- filled warning. They should not. For our galaxy is under attack from horrific creatures from the unfathomable darkness of deep space. Hearing their cursed name brings even hardened war heroes to tremble. They are known to us as the Shadowscythe. Invaders rumored to be spawns in the plane of Darkness itself. These shadow beings fuse their twisted darkness form with the technology of the races they have conquered. With each planet that falls to them they become stronger, smarter, and far more deadly. The full assault by the entire Shadowscythe Armada has begun! They are quickly approaching our alliance of worlds. The final battle of our war against the Shadowscythe invaders... has already begun. BEHIND THE SCENES Yes friends, it is finally time! Just as the main storyline of DragonFable ended with a bang nearly two years ago, MechQuest is ready for its main story’s grand finale! 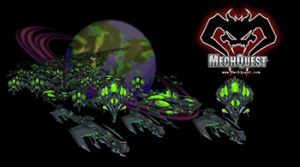 We are rapidly approaching the mysterious and highly anticipated moment which will finally reveal why MechQuest, a world with giant hulking laser and missile filled mecha came BEFORE the swords and sorcery world of DragonFable. If you think you know what will happen... brace yourself. While the ending was known to us 5 years ago, we are only now revealing it in full... and it is still the craziest, most bizarre, and surprisingly logical conclusion to this great game. ANTI-RUMOR CANON I would like to dispel a few rumors. MechQuest will be the second game with a “finished storyline.” When DragonFable finished, it was amazing. In fact, so many people returned to DragonFable and upgraded during the finale that resulted in the creation of DragonFable’s second chapter. Even if DragonFable not had a sudden resurgence, we would have continued to update it periodically and have seasonal and holiday events. Unlike some other game companies *resists urge to post links* our games never go offline. But it is important to the future of our gaming community that we continue to innovate and take the games to exciting new places. I would very much like to see in our future, a new version of MechQuest on iPhone/iPad/Android & other mobile devices. I would also like to see a in-browser 3D MechQuest PvP game where you are actually looking out of the cockpit of your mecha and can move around and fire. WHAT!? All six of Artix Entertainment's games are now under attack! Ebilcorp has sabatoged our 10th anniversary by unleashing millions of corrupted monsters into each of our games. According to the video, unless we can defeat all of them by next friday... they will trigger "gameocide" and destroy our entire game network! 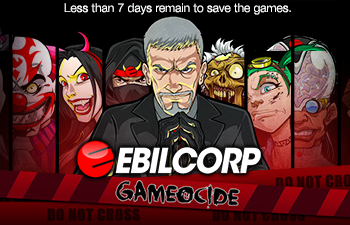 We are calling ALL players to help us defeat Ebilcorp and save the game network. Remember, this event is not happening in one game, it is spanning across ALL SIX of them. 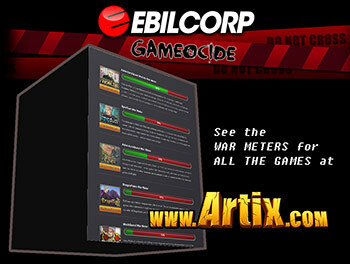 Track the progress of each game’s war at www.Artix.com! Once your world is saved, help your fellow Heroes rescue their games! 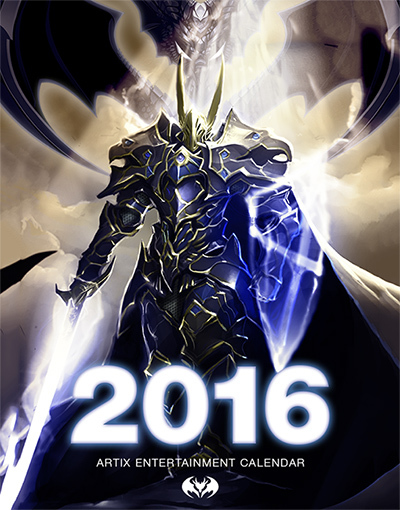 The war to save Artix Entertainment has begun. So this week's release is(was) (it has already rolled Live) tonight - Wednesday! We heard you like a lot of experience and credits when you play, so there is a new permanent quest for you to have the chance to gain a LOT of both! Susie is standing to the left of Tek's Mechs in Soluna City. It used to be that all she wanted to do was to duel you - but now she has a mission! If you talk with her, she'll tell you about her Senior Project. If you will go on patrol looking for the ultra-rare Berserker Shadowscythe Hound that sometimes attacks in an area of Loreon known as Sector Sixty-Seven - and if you find the rare Amanita Warp Disc* that powers this unstable monster, Susie will give you a massive reward - an astounding amount of experience and credits! There is a Skip button so you don't have to click through a ton of dialogue - the common Shadowscythe enemies give normal rewards, and the quest brings you back to a point where you can replay it over and over in quick succession, hoping to encounter that Berserker. And ... wait for it .... there's MORE! We also have a Fan Table in the Hyatt this year! Stop by each day for a visit with different members of the AE team, and to get a special ribbon to hang on your DragonCon Badge, specially made by Jemini - a different dragon for each day! (Come early - supplies are limited.) Bring your artwork for the drop-box, too! Char, Korin, and I will be "manning" the table on Sunday, September 4th from 10 am to 12 noon! We're really excited and hope to see as many of you as possible! Can't make it this year? It's an annual event, so start planning for the future! See ya! *Can you guess why the component has that name? ** "We" includes more than just MechQuest's Korin and Maegwyn - some but not all past and present members of the MQ team such as Char, Jemini, Thyton, Lyris, and even J6 - and lots of AE staff members representing all of our games! The ENTIRE AE Team is taking a one week break from making games... TO MAKE GAMES! Yes my friend, you read that right! Next week, starting on Monday we are having the 1st ever one-week-long AE Game Making Challenge! Sound crazy? ... well, then maybe you should join in too! WHAT!? You are making 7+ new games next week? 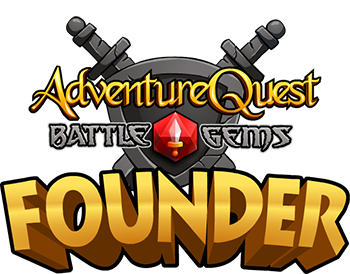 The entire staff (everyone from AdventureQuest, DragonFable, EpicDuel, MechQuest, AdventureQuest worlds) will be forming into small teams of 2 to 3 people. Each team's goal is to create a new game in only 5 days. The rules are: Anything goes & make anything you want! So far there are 7 teams. The competition starts on Monday and ends Friday night... at which time we all get to play everyting that they make! If you can program or draw, you are hereby invited to create teams with other creative players and create games too! 100% YES. After doing the weekly releases every week, for so many years, the team needs to mix things up and get their creative juices flowing. That is something that all of the big games will benefit from in the following weeks. Also, it will be really interesting to watch and see what happens! Everyone is making whatever they want... so your guess is as good as mine, LOL! But there is only one week to make the finished game so they will likely be mini-game sized or prototypes/alphas for larger game concepts. Teams can create their own artwork, sound, and engine from scratch or are free to use things thay have already made. The goal is to be as creative as possible and have fun, there are no rules... just games! What about the normal Big Game releases? This Friday (just like every week) we have exciting releases coming out for you. Next weekend the games will all be running their special Valentine's Day events. So this really was the perfect time to do this. The best part is... if all team are successful, you could get 7 new games to play next Friday too! Maybe we can add achievements for beating all of them to the Master Account? SuperRewards, the company that provides the 3rd party offers in AEXtras, is doing a iPad giveaway promotion. One lucky player of our games is going to win an iPad*. Yes, they set aside one just for our games so we are guaranteed to have a winner. All you have to do is complete any offer between now (August 6th) and September 6th, 2010. The more offers you complete, the higher your chance to win. You must be over 13 to access the offers.... as always, be careful! Always read the small print. Especially because the good offers are being used up fast during the promotion leaving those ultra shady ones**. I would not ask you to do something I have not done myself, so after carefully researching each one, I did two offers this morning. The ones that ask you to watch a video are by far the safest. Although they require a facebook account. Second safest would be the surveys that do not require you to enter a phone number (stay clear of any that ask you for your cell phone number and have the words "monthly fee" anywhere in the text) On a wierd note, I am totally going to use this if I ever switch car insurance companies or get Direct TV. So again, be safe and good luck -- hope you win. * Which is funny... since the iPad does not support flash, so you cannot play our games on it.... maybe it will make a nice paper wieght? ** What? They have non-shady offers? The MechQuest team is super-excited about a ton of things - Korin & I were just talking about the new Museum exhibit while getting some testing done on the new weapons for Planet Yokai. And doing a bunch of other stuff. We're big on multi-tasking - I'm eating cherries while doing stuff in the database and reading the Gremlins and General Discussion sections of the MechQuest forums, while waving a magnet over my ear, thinking about typo-fixes and pondering what Gianna Glow might have meant when she said, "Otter Bomb"... and if I told you what Circe & I were considering, I might... have to... nah, couldn't do THAT! So yeah - the MQ team is also working on the SCMM - the Cosmic Talon! Korin & Arklen are working together on animation/attack-related things so that either Korin or I can get the number of hits/animation description for each attack over to blues so he can design the specials. I've got the basics set up in the database, though the default weapons names and descriptions have to wait until I see how they look and what they'll do - then we'll work with Vivi (and whoever else on staff is around to help) to get it all tested & balanced. The plan is to have it all set for Monday. I'm insanely excited about the AE CD, "Critical Hits" - by the NPCs! We've got some cool promo weapons planned for the CDs. I can hardly wait for the premiere of the new HeroMart Store (which I've been told will open shortly) - and the new ChickenCow Shirts! Well, blues wrote up specials which were supposed to be posted early last weekend except that Korin was at Metrocon & I was swimming ... and ok, also I goofed off a little playing AQWorlds ... we jumped into this week with both feet and suddenly it is Thursday somehow! So read the post below this for the info blues prepared & wanted you to have on Saturday! If you haven't read it already. Because I spent like 2 extra hours agonizing over whether these DNs were funny enough/informative enough/tooooo boring to post ... what do you want to read? Please tell us on the forums! Target is offering 10% off! As announced in the Target stores circular (much better than a square-ular) starting today there is a special promotion! 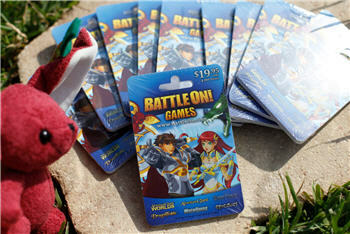 You can get any of our GameCards in Target stores at a whopping 10% discount. ( Off their end... not ours! So go for it!) Get $20 worth of upgrades for only $17.95! 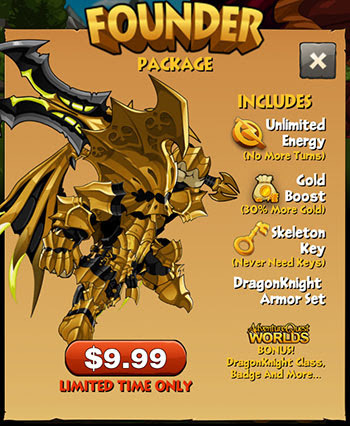 Do not forget you can finally stack up cards to get bigger packages in the BattleOn Master Account System. This Target promotion ends on July 31st. 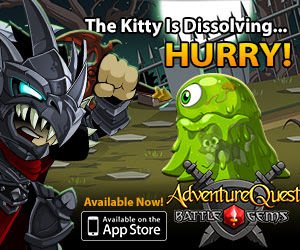 New "BattleOn!" cards will start showing up on store shelves too! Do not forget... Metrocon Convention is next weekend! I will be at Tampa's largest anime convention with Nythera, Thyton, and many other members of the AE team. If you are going, please stop by, I would love to meet you! (Please save any undead Cosplayers if I forget where I am.... ok?) Thyton is going to be sketching random things to give out. We might even se up a little portable DVD player with game footage... and terrible live-action ninja martial arts movies that we have been making during the weekends at unmarked construction sites. Oh! ... and Nythera told me to remind you that we will have Chickencow T-shirts, Artbooks, and some other experimental new things with us :-) This is the first time we have ever done this -- I am a bit nervous, but it should be fun!